Exposure Lessons, in order | Stop Shooting Auto! I started this blog in order teach people how to use their digital SLRs better. Unfortunately, the blog format isn’t always conducive to lessons, since blogs read in reverse order and when you’re learning something you want to start at the beginning. If you want to work your way through the material in the order it was presented, use this page. There’s also an Index of entries that lists material outside of the normal scope of exposure lessons. How your camera works: this is a six-year-old’s view of what’s happening inside your camera when you take a picture. The three things that go into exposure: When you take a picture, there are three basic things you can control to affect whether the resulting image is too dark, too light, or just right. Here’s what they are. Shutter speed, how it works: The basics of shutter speed, and what different speeds look like. Shutter speed, why you care: Some cool effects you can get by changing the shutter speed. How your camera works– the meter: Your camera is pretty smart, and it’s good at guessing how to get the picture right. Here’s how that works. How your camera works– exposure modes: What’s that funny dial on the top of my camera? What does Tv mean? Exposure modes exercise: OK, this is it. We’re going to take the camera out of automatic mode and try out the controls. It’s scary, but I’ll hold your hand. Shutter speed exercise: Let’s take some pictures! We’re going to play with different shutter speeds so we can see how they affect the resulting image. Quick review: A quick summary of what we’ve learned so far. What’s that f-stop stuff anyway? What aperture is, and why it isn’t so scary. What does f/8 look like? Visual examples of different f-stops, and a mini-exercise so you can look at your own. Aperture: Why You Care Depth of field, and the cool effects you can get with it. Quick Exercise: Focusing Grab the camera and watch how the focus point changes as you turn the ring. Depth of Field: Another View Let the ruler show you how depth of field works. Exercise: Depth of Field Get out your camera and try it yourself. ISO: What is it? What does ISO mean, and how does it work? ISO: Why You Care Examples of what your images might look like at high and low ISOs, and how to choose the best one for your shot. How much more light? How much less? Is f/4 twice as much light as f/2? Is a shutter speed of 1/100 twice as much light as 1/200? How the settings play together If you change one setting, you have to change another one to get the same exposure. This is great, just what I’ve been looking for. I got a Nikon D40 for my trip to Alaska and want to make photography my Hobby. Thank you! You’re exactly the sort of person I’m writing for. Found you via Joe Decker’s blog – thanks for the plain language lessons. Just ordered my first SLR (Canon 40D) and every little bit of advice helps. This was exactly what I needed to have a basic understanding of what my camera does. I really appreciate the information being given in such a clear (and witty!) way. Now I won’t feel SO lost on photography forums and so fumbly with my new dSLR! Many thanks! Thanks for putting this blog together. I got a new Olympus Evolt E-510 for Christmas and I was pretty lost in Auto until I found your post. I would love to see read about more advanced features sometime in the future, especially white balance, etc. I look forward to reading all that you have to offer hear. I currently only have a film SLR, but it is my dream to have a dSLR. Because of the cost of developing film I do not play with my SLR much. When I am not sure what I plan to take pictures of I use my point and shoot digital so that I can just keep shooting and then delete the ones I do not like. Again thanks for creating a blog for us to be able to learn from. This is exactly what i needed as a complete beginner and has made me feel that i will get the hang of it! Its made study at home fun. Thank you. Wow, what an amazing, informative site. I am working my way up to getting a DSLR camera and the lessons on this site have encouraged me to use the manual controls on my existing camera. Smiled at the gnomes behind the curtains frantically writing down what they see. I shall never look at my camera in the same way. came across ur site thyru a post on flickr and i love it.will look forward to it in future.keep up the good work.and while on it b,what about some light on exposure bias? I’ve been trying to get comfortable using the different ISOs. I love the quality of ISO 100, but I’ve learned the hard way that I must use 1600 when using it without a flash while attending low light events. I have a book on the Rebel XTi and it says that ISO 1600 is actually better than 800. It helps to have an IS (Image Stabalizer) lens as well. This is a great blog. Thank you for taking the time to help us! Cheers! I just happened along this site and I’ve got to tell you, I love it! Keep writing, I’ll keep reading…and learning! Thank you for your site! I’m always so thrilled to come across a site like this, full of knowledge and willing to share. It seems disheartening a lot of the time searching the internet for understanding…only to find photographers who forget that they weren’t born with the knowledge. And it’s a shame how some of them forget about how the Artist Community functioned pre-AOL. Again, thank you so much for sharing your knowledge! I’ve sent this to all of my DSLR friends! Thank you, thank you, thank you. I love this site. I recently bought a Canon EOS Rebel XSi and of course I’m still learning how to use it. Your site makes it alot easier. I do have a question I’d like to ask. How do I take shots of the moon (in any phase it’s in)? I keep getting it over exposed and it’s frustrating. I for one appreciate your time in teaching us “newbies”. I’ve sent this site or told all my DSLR friends about you. Thank you so much for all the information that you have put together. I am planning to buy a D90. I’m a little nervous as it’s my first DSLR purchase ever!!! …at the same time very excited. I will be going trough all the resource that you have out here, it’s gonna be of great help to me. Just a question, when shooting, do you spend time on the viewfinder to get your subject on perfect focus? ..or is it a natural habit to set the Focus to Auto? Thanks for the tutorials! Great help… I just bought a camera (Pentax K-m / K-2000) and I’m going to practice all that have been thought here. Prince, that’s a slightly complex question. For the most part, I use autofocus. For most images, it works really well. There are exceptions though. If I’m doing something at a very wide aperture, where I have almost no depth of field, I will generally focus manually. For example, if I was taking a portrait with the lens wide open I would generally manually focus, because I want to make sure that the eyes are in perfect focus– if I let the camera do it, it may well choose to focus on the tip of the subject’s nose. If my subject is significantly off-center I’ll probably focus manually. Sometimes the camera is going to want to focus on something other than what you want. For example, look at the rulers at the top of the page– in those photos, I wanted to make sure that the 12 was in focus so that I could have consistent examples. However, if I left the camera to its own devices it probably would have chosen to focus on the 9 or 10, and that was definitely not what I wanted. In that case, I can tell the camera to pick a different focus point other than the one it wants to use, or I can just kick the lens into manual focus mode. I’m usually too lazy to pick a focus point, so I just use MF. Finally, I have to say that focus problems often aren’t really focus problems– they’re often motion of the camera or subject from using a shutter speed that’s too slow. Autofocus systems are actually quite complex. Some of them will favor vertical lines rather than horizontal ones, or vice versa. I’m not an expert, but I’ve done a little bit of reading about them. Thanks for giving me you thoughts.. much appreciated. this site looks to be exactly what I’ve been looking for to help me become a better photographer. What were the aperture, shutter speed, and ISO of the images that were underexposed? I just checked about 7 of the photos. The ISO was 400 in all cases. And how underexposed are they? Can you take a test shot ahead of time or early on, and check the histogram? Use a spot or center-weighted metering if you’re going to rely on the camera’s meter. Or maybe set the exposure compensation to -2 or so? Fortunately, it was an overcast day. As it was, the bodies were extremely dark against the sky. Without exception, I had to adjust the brightness and occasionally the contrast with Windows, in order to see who was actually on the bar. Ugh. I changed the focus to center weighted after consulting the manual. But… there is another setting related to CW that tells how big a spot the center is supposed to be. This can be 6, 8, 10, or 12mm. The default is 8. Is it not possible to see what the camera picks, then alter the settings? Like… if it wants f/16 and 1/1000, maybe I should change it to f/8 and 1/800? But this is kinda guessing too. How would you do it? That’s what exposure compensation is– you tell the camera “make your best guess and then under (or over) expose by 2 stops” or whatever. You could also meter, look at what the camera chose, then drop your camera into manual mode and use whatever setting the camera chose minus whatever factor you think is appropriate. And shoot in raw so that you’ll have more latitude to correct later. I don’t have any software to view or edit a RAW image. I did shoot in the biggest size the camera would do. I tried the exposure compensation thing and it didn’t work too well; got black pictures. I was probably doing it wrong. But then I took a test pic on auto, used those parameters and started adjusting them manually. Left the shutter speed alone and jacked with the aperture to get more light. I’m happy. They didn’t turn out too bad. Did one lying under the net (at the edge) and shooting up through it. I think I can do that better and get the net to not be quite so prominent. I had so much fun today. Put a couple of the dark photos up on flicker as well as the light ones that I took today. More practice pictures tomorrow before the instructors do their thing Monday. Hope it doesn’t rain! What a wonderful “blog”. Just purchased a Canon G10 and my eyes are glazed over as is my brain. Confused about depth of field etc. Can you help me understand iso, etc. Nancy, this blog is all about things like ISO and depth of field. Read through the exposure lessons in order, and do as many of the exercises as you can– the G10 should be capable of almost all of them, though some will work better with a dSLR. Once you get to the end, you should have a good understanding of things like ISO and depth of field. This is perfect, just bought Canon EOS 500D, now to learn how to use it…….. Think of learning to use it as a journey rather than a destination. No matter how much you know about the camera, there’s always something left to discover. However, I find my photos on Pentax more vibrant than those in Canon..again, is it just the settings or is it the camera? Faster autofocus could be the camera or the lens. On some cameras, lenses with wider apertures will focus faster. Some cameras are better at autofocus. Most likely it’s the lens, though– some lenses have very fast autofocus motors in them, while others take their sweet ole time about it. One more thing (i know this is going to sound dumb…) what does “L” stand for on the 17-40 f/4L lens? And also does f/4L mean that the widest aperture for the lens is f/4 ? It’s not a dumb question. L lenses are Canon’s top-of-the-line professional lenses. I believe that the L stands for low-dispersion, but I’m not 100% certain of that. 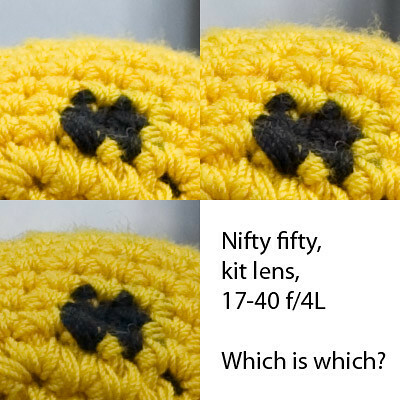 Yes, a lens that’s described as f/4 or f/4L means that f/4 is its widest aperture. I really appreciate you taking time to answer the question. I have spent hundreds of dollars on books that explain exposure, light compensation and basics. I do not understand a word of them. I was about to sign up for a college class just to understand how to use my Canon 7d. I bought it for a 1 month Europe trip im taking in the summer and im trying to get the best images i can on the trip. You have better knowledge and the best teaching methods i have ever seen, after taking your tutorial i understand miles more on my camera than any of those books tried to explain. THANK YOU SO MUCH! your an amazing instructor! you done in 1 hour what books and questions couldn’t do in 9 months! thank you! Here’s what you do next: spend some time playing with the camera in various exposure modes. When you’ve done a bit, go crack open one of those books. I recommend Understanding Exposure. I bet you’ll find it a lot more approachable now, and you’ll pick up a lot of subtlety and detail from it. I am shooting for the first time in the Grand Canyon. I have a canon rebel Xt with the following lenses: 58mm wide macro, 28-70mm, 70-300mm, and a 500mm. and some filters. Which is the best set up? What about shots from a plane ride? For shooting from land, you probably want the widest angle you have– in this case, the 28-70 at 28mm. That will be the best for getting vast expansive landscapes. Is the 70-300 image stabilized? If so, that’s probably a great option for the plane ride. It may still be your best bet, since it’s a good range for the distance. Take the 28-70 along as well, though, in case it works better. 500mm would be horrible on a plane– too big. Your articles are so great. Very straightforward and simple. I write a blog for aspiring baby and child photographers, and have found that most people who are putting themselves out there as a professional photographer these days don’t even know these basic concepts. I have just posted an article directing people here because your articles are much less daunting than so much of what I have read. Thanks! Great list have you thought about adding information about the zone system? I haven’t. Want to write something beginner-level about it? Bravo ! This is the best site I have come across so far about photography, I just can’t stop reading. I just bought a Canon 550D 2 weeks ago and started with reading manual, user’s guide and web sites forum. Smart people (with high IQ) can complicate simple things. Wise people (with high EQ) can simplify complicated things. You are no doubt a guy with wisdom. I dont usually write comments on websites, but this time around I am so compelled to. I have been searching all over the net and bookstores for an easy to understand basics of photography, and I can tell you nothing beats this site especially the lessons section! Thanks so much Patty for putting this together, appreciate your efforts, it goes a long way for many an aspiring photographer. I recommend your site to fellow beginner photographers as the only site they should visit and stop wasting their time like I did searching around and they will get all they need here. Bravo and keep it up Patty! Wonderful starter-kit for a budding photography enthusiast. Keep up the good work! Wow, hi. I really can’t say how valuable your website has been to me. I’m a “read the whole manual before touching one component on my new gadget” sort of chick so I am used to learning through reading, but GEEZ! I have never understood the basic functions of my camera so quickly and thoroughly. It gives me hope that I can learn the less basic things in the near future! Another compliment: Your website is perfectly named. I had a friend tell me “You need to stop shooting auto.” I agreed, so I typed “stop shooting auto” into Google and your blog “Stop Shooting Auto!” came right up. It couldn’t have been any easier to find in the sea of blogs online. Thanks! That is precisely my goal– to make it all as easy as possible to understand. This is a great article, I have been using the manual modes for a little while now and just need to grasp how they work in relation to each other. I have learnt everything I know so far from all over the web. I wish I had stumbled upon this post first. If anyone I know makes the step up to SLR or even wants to learn there P&S manually I will be pointing them in this direction. Thanks. Thank you! That was exactly my goal. Every once in a while, people like you come along, and make things so crystal clear, and inspiring. I have read a fair bit about photography, and NOBODY so far is able to present things the way you do. Perhaps the best teaching I’ve had ever. The proof of your genius is in the age of it. 2007 to date, and still relevant. You have Liberated me from the shackles of Shooting auto. Please see my shots so far (in Auto), and look out for what is to come after your Lessons so you know what you have helped make happen. BTW, I will really like to know what your thoughts, comments / critique of those shots. It can only make my shots better. I wandered through your photostream, and you have an excellent eye. Keep up the good work! If I could find one criticism, it would be that some of the more recent images feel oversharpened or otherwise overprocessed to me. It makes them feel very artificial. That may well be your intent, in which case, carry on and ignore what I have to say. “When the master paints” is one where I can see strong sharpening halos even in the smaller versions. “Vergessen Boot” feels weird to me too, like HDR gone awry. The barley picture is phenomenal. I expected that. Even I know that I went overboard with after processing. Will be taking a few shots (Manual) over the weekend.